The key to saving this Thanksgiving is to think and plan ahead. It’s never too early to start considering the cost of the holidays, especially when giving yourself some extra time can allow for great discounts and finds. The first step: confirm your Thanksgiving plans. Are you hosting dinner this year? How many people are attending? Once, you’ve sorted out the basic details, use the following tips to cut holiday costs without cutting corners. In the days or weeks before the big holiday dinner, start watching the prices at a few nearby grocery stores. Maybe the local market has a good price on fresh veggies, while the supermarket up the street would be a good place to stock up on pumpkin pie mix and other canned essentials. If you take the time to decide which stores offer the best prices for each item, you could save yourself quite a bit over regular retail prices. One of the most common tendencies on Thanksgiving is to overbuy. When many of us think of Thanksgiving, we conjure images of a huge feast which can get exaggerated as we expand our shopping carts to accommodate out-of-town guests. Before you check out, consider what you really need, and what ingredients you might already have in your pantry. It’s best to make lists; one list of all the dishes and beverages to be served, and then another of the ingredients required for each of them. Making meals from scratch as opposed to buying boxed or canned goods can also save money, and it’s possible that a few core ingredients are already in your cabinet. When you know exactly what you need (and what you don’t need) from the grocery store, you won’t overbuy and you’ll be less likely to forget something. During the holidays especially, retailers are all vying for your attention with coupons and sales ads. Coupon clippers who start early can accumulate coupons for almost every kind of item needed, from milk to serving trays, to plastic silverware. Consider the food and non-food items required to host Thanksgiving and clip all helpful coupons, even if it means trying an unfamiliar brand. If you don’t have at least ten ceramic turkeys to deck your house with the obvious theme, don’t worry. You don’t need a bunch of overpriced décor pieces specific to the season—just liven up space with accents. Artificial wreaths of orange and gold colored leaves can be hung or laid across shelves. Purchase a few real, baby pumpkins in different colors and place them around the room. And don’t worry about finding a pricey quilted runner for the table. Instead, layout fall toned fabric from the craft store or consider some inexpensive placemats to add interest to your dinner table. Some relatives are more than happy to bring a dessert to your Thanksgiving dinner and might have planned to do so anyway. Consider asking people to pitch in on desserts, midday munchies, or even items like loaves of bread or extra dishes. Many Thanksgiving guests just want to help out as much as they can, and their generosity could save you lots of money and effort. 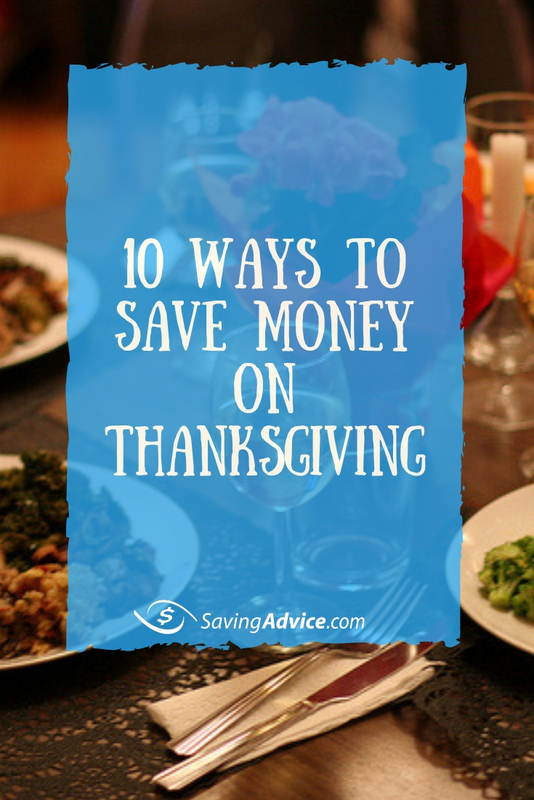 If you’re only responsible for a small portion of the dinner, the stress (and the bill) won’t be all on you. Talk to your family and friends beforehand and ask if they’d be interested in a different style of Thanksgiving this year. They’ll all be thankful that the burden of buying is dispersed. Instead of spending the whole night at one relative’s house, you could each contribute just a dish or two to the dinner. Get your neighbors involved, and each house on the street could be a stop for friends to enjoy another course of the meal. Your perfect turkey might be waiting at the grocery store right now, on sale as part of a buy-your-bird-early special. Or, your perfect bird could be a lot cheaper per pound with a coupon you find in the newspaper or online. Some people can even score free or heavily discounted birds by taking part in promotions that aim to get people excited about Thanksgiving shopping. You never know when someone will have a great deal on just the right sized bird, so be on the lookout. You might be eager to impress this Thanksgiving, but attempting something complicated is usually a big stress on you and your wallet. Remember not to splurge on specialty ingredients that won’t be noticed anyway. Don’t try that new, complicated recipe that is only going to cost extra time and money to make. Stick with dishes you are familiar with, and do them well. That is impressive enough. Who knows, you might need a super-sized cheese platter and twenty pounds of mashed—but chances are you don’t. You can definitely save some money by purchasing items in bulk, but get only the essentials this way. You might need plenty of paper towels, frozen appetizers, and wine, but fresh and specialty ingredients can go to waste if you get too much. Save yourself some money by reusing all leftovers well. You don’t have to serve the same old turkey with gravy or plain sandwich on Black Friday. Repurpose mashed potatoes into a filling, savory pie. Try turkey paninis with some leftover Thanksgiving bread, and use the cranberry sauce as a spread. Even leftover veggies could be rolled into a wrap or sprinkled onto a salad. Making your leftovers more appetizing will keep your family from being tempted into going out for lunch. Lastly, consider yourself on Thanksgiving. Yes, it is a time of giving and sharing, but the hostess or host also needs to be comfortable on the day of the big dinner! Your family and friends know Thanksgiving can be a financial burden, so ask for their help buying and prepping the dinner. Who knows? You could start a new tradition.